¿Que piensa usted de Rafael Correa, el presidente? What do you think of Rafael Correa? Hope for the world, or hypocrite? Finding out more about Rafael Correa was my main inspiration for visiting Ecuador. A charismatic indigenous1 leader who had stood up to the Americans, in refusing to have an US base in Ecuador (at least till Ecuador is allowed one in the US) and even more dramatically had declared Ecuador’s foreign debt illegal and refused to pay – after a meticulous audit of the basis of the debt. He doesn’t have Chavez2 flamboyance but then he doesn’t have his oil. And he seemed to me to have a more grounded sense of liberation, maybe because much of the oil Ecuador does have is in environmentally sensitive areas. Last year he set up the Yasuni Iniative – proposing that Ecuador would leave untouched the oil reserves in the Yasuni region – one of the most biodiverse places on earth. To support this the government would encourage concerned people across the world – governments, companies, and individuals – to buy bonds supporting this. The main condition being that this support raised 50% of the value of the reserves (~$7.2bn). 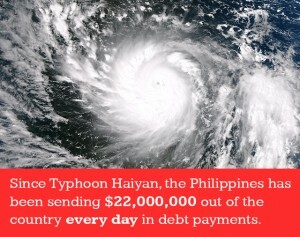 For a tiny country just emerging from poverty this seemed to me to be pretty damn brave. I wanted to find out if Ecuadorians thought he was as good as he seemed to me, and whether cancelling the debt had made a noticeable difference. So when I finally got to Ecuador I asked everyone I met . . . teachers, civil servants, campensinos (farmers), hairdressers … I didn’t feel there was any specific group whose opinion was more valid than another, some may be more powerful but I was interested in how Correa had affected people so I asked whoever I met and whoever would answer. Though as I generally stayed in cheap hostels and travelled on cheap buses most people I talked to were on the poorer side of life. Coming to Ecuador from Peru, even without talking to anyone, there was clearly a great improvement in terms of economic development. Computers, in particular, were magically better – as was food. Transport was more coordinated and sanitation was generally easier to use. And environmental awareness was much more obvious, with a huge variety of ecotourism, a Constitution that defends the ‘rights of Nature’ and even recyling in some areas. And every single person I met said they felt Correa was a good thing for the country, albeit sometimes grudgingly on the part of intellectuals. 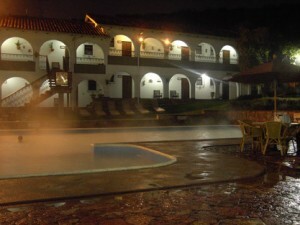 The Baños in Cuenca aren’t a particularly egalitarian place – they are naturally heated pools, (by volcanos and with healing properties my aching limbs could attest to) – but it costs $5 to get in – the price of a room for the night – and the leisure time to lounge around in hot steamy water for a few hours. But its a great place to talk things over so here my inquiries became more focused. The bathers in the Cuenca baños are loosely divided into three groups. By far the most formidable is the older women, slightly in the background are the older men. The third group is the younger women – under 40, still sexually alluring. Although I’m long past 40 my white skin and blue eyes seem to make me eligible for both age groups – at least so I like to believe3. 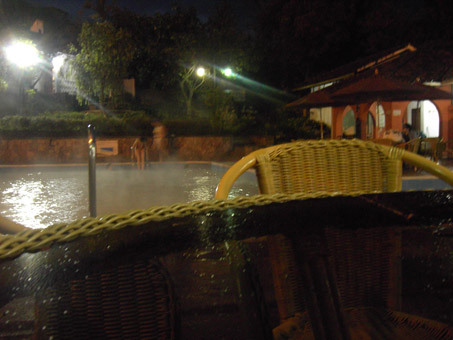 There were also one or two single men lounging on their own, sizing up their chances. . . . . The older women were already talking politics. Local taxes on fuel were on the agenda, particularly after “el impuesto verde” – ( the green tax) introduced earlier last year. A tax on new cars, according to their engine size. The consensus was that this was a good thing as it would pay for the school buses. I ask them my question – what do you think of Rafael Correa?- and they all talk at once for a minute . . . he is a showman but heading in the right direction, he is corrupt but less so than other governments, he talks well, but what about his friends, . . . then Rosa, a large imposing woman talks, presumably for all of them – “He has done a lot for Ecuador but we don’t like the company he keeps “ – “What do you mean?” I say ( although I can guess as I’ve heard this comment repeatedly) “Chavez, Morales2” she says darkly “they are communists, dictators.” And we talk a little about the difference between socialism and communism and democracy. I often heard in Peru, particularly on the heavily Americanized television news, that democracy is the opposite to socialism and communism which are almost synonymous. I try to tell them how England is a socialist democracy,like Ecuador, but they lose interest and Rosa moves away looking closed. A man behind me gets my attention saying – “Correa is a socialist, he introduced a lottery to make people pay their taxes.” When I ask more he explains that before Correa few rich people paid their taxes. But now when they pay their taxes they get a chance to win $500,000 so everyone pays. I’m delighted and slightly unbelieving and he moves away. And the women start talking about pollution and how important the green tax is. And how the Amazon is the lungs of the world. And then I ask my latest question – on my way to the Baths I’ve seen the graffiti on the wall: – ‘Correa Minero el Agua Primero‘ (This doesn’t translate directly but means something like “Correa mines the primary water source”) – the first direct criticism of Correa that I have come across. So my question is about the issue with mining and water sources. And it brings the conversation to a halt for a minute. And then everyone agrees its important and ‘la contaminacion’ from fuel is a serious problem, and the impuesto verde is a good move to solve the problem but they have changed the subject. As in Peru, mining in environmentally sensitive areas is a continuing bone of contention. Both countries are developing fast and want the modern lives they see repeatedly on telly where happy white people are happily consuming. But both countries have strong indigenous communities for whom the health of the environment is a very immediate issue, not just an ethical concern. And most of the natural resources of Ecuador – minerals, gold, oil – are on indigenous lands. 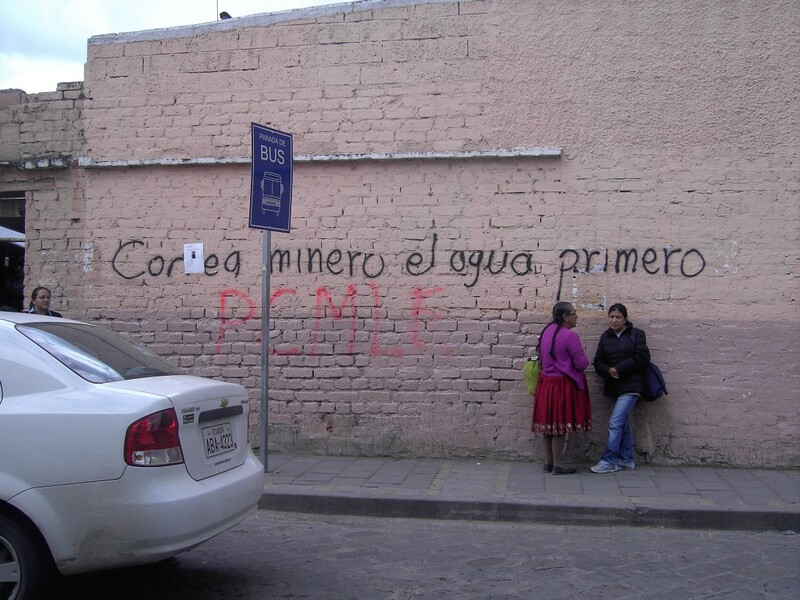 And what no one mentions in the banos, but I find out later in the local paper, is that there was a large and vigorous indigenous conference in Cuenca in the summer about water rights and the extreme and repressive actions taken to silence the people who protest for these rights. Again what they don’t tell me, and what I discover later on the internet is that, although the right to protest and the rights of nature are enshrined in the Ecuadorian Constitution of 20085, instituted under Correa, 100s of people, mainly indigenous people, have been charged for protests in defence of land rights, water rights and human rights. And leaders have prison sentences of up to 16 years. And so the tiny country of Ecuador, population around 15 million ( London’s population is around 8 million) is right there on the frontline of our modern dilemma. Over half the country below the poverty line, a stream of images of happy white consumers on the telly, a huge wealth of natural resources in ecologically fragile areas and rich goverments all over the world keen to exploit them. ( Last year China lent Ecuador $2bn with an expressed interest in aluminium, copper and of course oil) . What choices does Correa have ? He’s between a rock and a hard place but its the indigenous people who are paying now and it will be all of us who pay in the long run. Because as Rosa told me – the Amazon is the lungs of the world. If the message Ecuador gets from the world’s response to such an imaginative and innovative project as Yasuni Iniative is half-hearted, what hope for the world? Meanwhile, back in the pool, and not at this time knowing the full extent of the repression, I say something about it needing more than tax on new cars, really meaning to imply more international support for ventures like Yasuni. But I have touched a nerve and the group loses interest in me. Rosa looks smug, like she has swallowed the status quo and I’m left on my own. I swim a couple of lengths. Then one of the young men sees his chance and we talk a little. He is a social science teacher and has been teaching about the history of culture around the world. He seems an excellent subject for more information but whenever I get down to the nitty gritty and ask him my question “¿que peinsa usted . . . ?“(“What do you think of Rafael Correa?”) he looks away nervously and tells me he has a very beautiful girlfriend, making the shape of an hour glass with his hands. I do have trouble pronouncing Correa’s name but I dont know what he thought I was saying. But then he was a social sciences teacher – he’d probably read about gringas2 . . . .
2 Hugo Chavez, president of Venezuela and Eva Morales, indigenous president of Bolivia. Both countries are actually democracies but often get called communist both in Peru and Ecuador – partly because some people contest the integrity of the elections, though probably more because both presidents are openly resisting American ideology. 3 See my earlier blog: ‘A Letter from Darkest Peru’ for more thoughts on being a blue-eyed gringa ( white woman) of a certain age, in South America. Stop calling caehvz a dcitator you lying liar, i dont agree with all of his politics, but you seem to be conveniently and sneeringly ignoring the fact that the man has won 8 elections – all certified as free and fair by international bodies, and when there was a business/military coup against him, which you no doubt approved of, the people of their own accord swelled out into the streets to re-instate him , despite the blatent lies being published in the print and braodcast media as to what was actually happening. How dare you call yourself a labour politician, how dare you call yourself a human being.